The holiday season is in full swing! In celebration, we played with color. 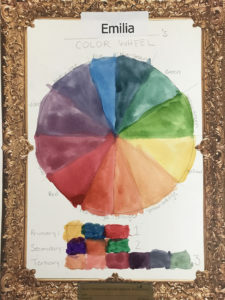 Our Art Adventurers explored color mixing by making their own age appropriated color wheel with watercolors! We then took inspiration from the Bauhaus painter, Wassily Kandinsky & created our version of his concentric (bulls-eye) circle color studies. But included some radiating Hanukkah Lights! 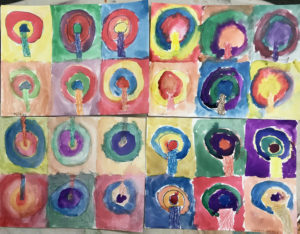 abstract, afterschool art, color theory, complementary colors, concentric circles, Hannukah, Kandinsky, Lights, paint, radiating, tertiary colors, watercolor. Bookmark. Oren’s CCA Student Art Show @ 79th & Lex! William Kentridge yesterday inspires yet more creative projects for CCA.